Event Decor Direct is pleased to offer these 4-Post Canopies (Chuppah / Modern Mandap) at factory direct prices. We even offer payment plans. These 4-Post Canopies (Chuppah / Modern Mandap) come in a variety of diameters to meet your needs. They are adjustable and are made to hold up to multiple uses. You can choose use from a variety of curtain colors and are available in both satin and sheer. 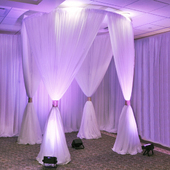 These 4-Post Canopies (Chuppah / Modern Mandap) are easy to set up and take down. Assembly instructions are included. Our 4-Post Canopies (Chuppah / Modern Mandap) are great for the bride who is doing her own decorating, as well as for professional wedding planners. If you are professional wedding planner who needs a top quality 4-Post Canopies (Chuppah / Modern Mandap), you need not look any further than Event Decor Direct. From traditional to modern weddings, our 4-Post Canopies (Chuppah / Modern Mandap) will be perfect for any occasion. 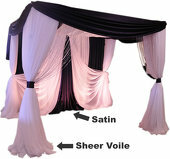 These 4-Post Canopies (Chuppah / Modern Mandap) are perfect for the customer who wants everything in one complete kit. These kits are used by a variety of wedding venues and wedding professionals who want the bride to have everything that they need on their wedding day. Do not forget to like Event Decor Direct on Facebook for an extra discount on your purchase. 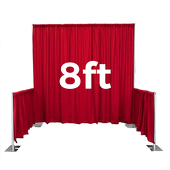 Customers who are interested in Four Post Canopies (Chuppah/Modern Mandap) also purchase Backdrop Accessories, Premium Backdrops, and Fabric Backdrops.